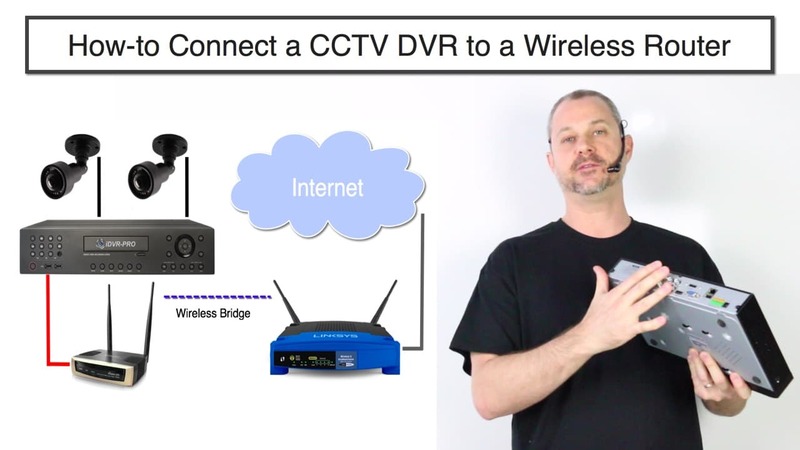 This video explains how to connect a CCTV DVR to a router wirelessly. This is not a DVR with built-in WIFI. I am connecting a wireless bridge to the hard wired Ethernet port of the DVR to connect to the router over WIFI. Please note that I recommend wireless security camera systems ONLY as a last resort. The solution that I explain in this article and video is no different. You are always better off running a CAT-5 or CAT-6 network cable for a hard wired connection if it is possible for you to do so. Sometimes customers install security camera DVRs in locations that do not have a hard wired Network connection. For example, maybe you ran all of your RG59 or CAT5 cable for your security cameras back to a closet where your DVR will be located, but you had no way to run a network cable from your wireless router to that location. Most CCTV DVRs and network recorders for IP cameras only have a wired Ethernet port (no built-in WIFI). Now, you want to view your security cameras remotely over the Internet and in order to do this, you need to connect your DVR to your router. 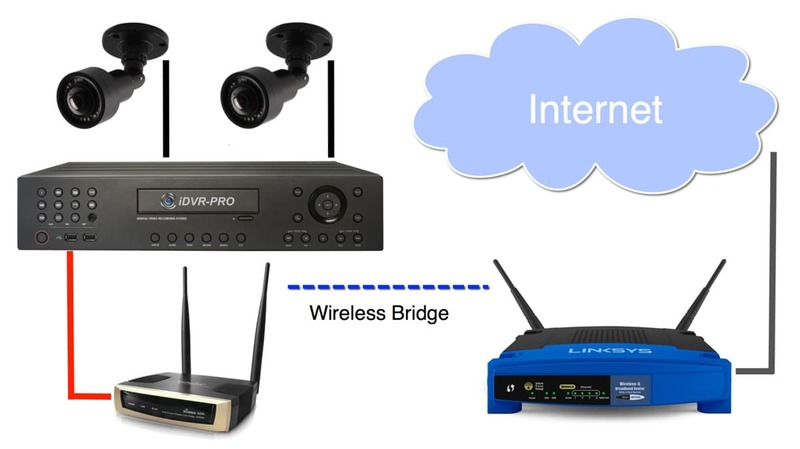 Watch the above video and refer to the below diagram to see how you can use a wireless bridge to connect your surveillance DVR to a wireless router or access point. Readers searching for the following topics should find this explanation useful. This solution documents how to connect a CCTV DVR recorder with WIFI, but please note that this same solution will work if you are using IP cameras with a network video recorder. This is how it works using the above example installation. There are two AHD-BL25 180 degree security cameras hard wired to an iDVR-PRO surveillance DVR. using RG59 Siamese coax cable. The iDVR-PRO only has Ethernet port for network connectivity (no built-in WIFI). The Ethernet port of the iDVR-PRO is hard wired to the wireless bridge using CAT-5e cable. I am using a WIFI-AP3500 for the wireless bridge. The WIFI-AP3500 is actually a multi-purpose wireless device. It can be configured as a router, access point, or bridge. This one is configured in bridge mode which enables it to connect to our router. The WIFI-AP3500 is configured to connect to the Linksys / Cisco wireless router using the WIFI. The Linksys router is connected to the Internet. This can be using a DSL, cable, dedicated fiber, or any other type of modem / Internet connection. If your goal is to access your DVR over the Internet so that you can view our security cameras remotely, you also need to setup port forwarding. Please refer to this article to learn how to setup port forwarding on a CCTV DVR. This the remote camera view on iPhone using the iDVR-PRO viewer app. 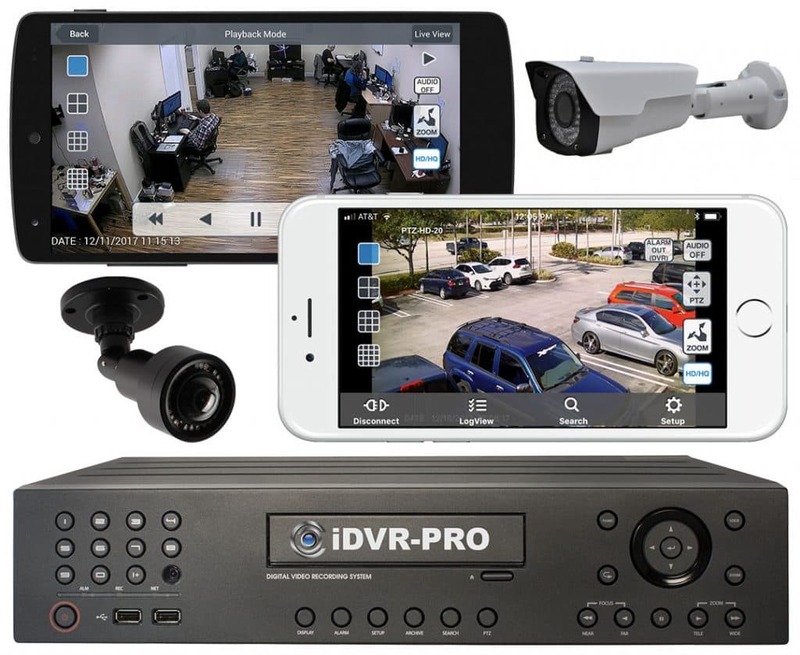 Users can also access their DVR remotely to view their cameras from Android, Windows and Mac computers. 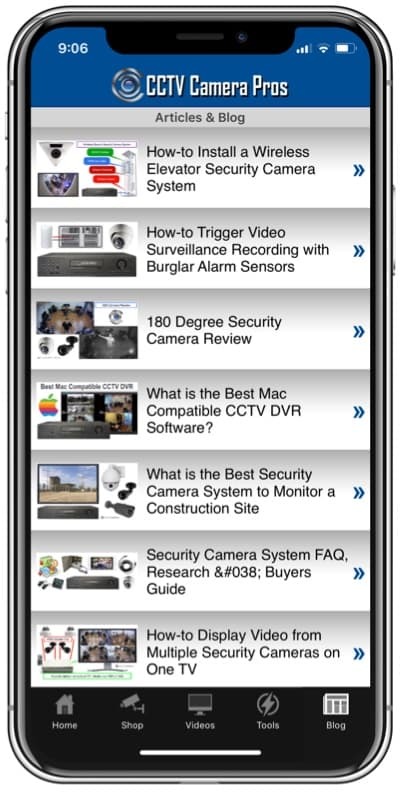 You can learn about all of the remote camera viewing apps and software for iDVR-PRO CCTV DVRs here. Here is a complete text transcription of the above video. How to connect a CCTV DVR to a wireless router or access point. This is the problem that we’re solving in this video. Let’s say I have a CCTV camera DVR. Basically, if you’re not familiar with that, it’s a DVR that the cameras get hardwired back to the recorder using coax cable. Most of the video surveillance DVRs on the market only have a wired LAN port. There’s no built-in WiFi built into almost all of these devices on the market. They are meant to be hardwired. I am putting my DVR at a location where I don’t have a hardwired LAN connection, so what do I do? I can use a wireless bridge to solve this problem. Here’s how I do it. Starting in the upper right, I have two bullet security cameras wired to my surveillance DVR. This can be any number of cameras. I just happen to use two. The black lines represent the RG59 coax cable that is used to wire my security cameras to the DVR. The DVR is hardwired to my wireless bridge using a Cat5e cable. I am using an AP-3500 for my Wi-Fi bridge, which is a multipurpose wireless device. I have mine configured as a wireless bridge for this application. The wireless bridge is configured to connect to my wireless access point. I am using a Linksys Cisco router for my access point and router in this case. It is the type that is typically used in residential and small business networks. My Linksys router is connected to the internet. This can be any type of internet connection, such as DSL, cable, or a direct fiber connection. Now, as long as port forwarding is configured properly on my router, I can access my security cameras from remotely over the internet. Now that I explained how to set up your security system DVR with a wireless access point, let’s go over the downside to that. Video streaming uses a lot of bandwidth and relies on reliability. You can’t have a network connection going up and down and speed varying. These are things that tend to happen with wireless. It’s just the nature of it. There’s interference from other wireless devices. Wireless is never as reliable as a hardwired network connection. That’s why these DVRs come with only a wired connection, because that’s really how they’re meant to be set up. I would say that using this method and implementing a wireless bridge for a security camera system is a last resort option. If you absolutely cannot run wire for an internet connection to your DVR, then use this. If you can run a wire, I highly recommend that you do so. If you’d like to learn more about how to do this and see the equipment that I used in my testing, please visit www.cctvcamerapros.com/wirelessDVR.